Kalyan Ram is trying his hands at a romantic story for the first time and the teaser leaves us with an impression that the actor seems to have fit the bill perfectly. Actor-producer Nandamuri Kalyan Ram was last seen in ‘ISM’ which was directed by Puri Jagannadh. The film had the trademark Puri style screenplay where the initial plot is established and later came the plot beneath what was shown. Playing a journalist in ‘ISM’, Kalyan Ram decided to go through a transformation and came up with a fitter look, and showed off his chiselled body in few scenes in the film. The film was a decent hit at the box office and did not give any reasons for the producers to term it as a loss venture. Kalyan Ram gave it a bit of time before he gave his nod for any film as a lead actor and in the mean while took up the production of his brother, Jr NTR’s ‘Jai Lava Kusa’. Kalyan Ram has two flicks up his sleeve – MLA and Naa Nuvve. MLA is being directed by debutante Upendra Madhav who assisted director Anil Ravipudi during ‘Pataas’ which starred Kalyan Ram in the lead. His second film, ‘Naa Nuvve’, is being directed by Jayendra who is an accomplished ad filmmaker and ventured into feature with 180 starring Siddharth, Priya Anand and Nithya Menen. The makers of ‘Naa Nuvve’ released a teaser of the film, also starring Tamannaah Bhatia, which gives us a glimpse of the film. 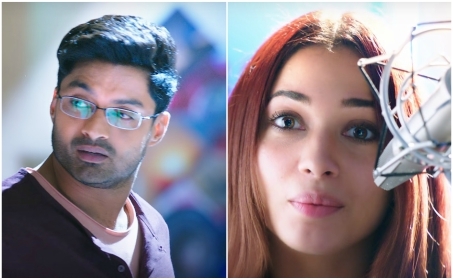 ‘Naa Nuvve’ seems to have a romantic backdrop and has Tamannaah playing RJ while Nandamuri Kalyan Ram seems to have gone through a massive transformation in terms of looks, again. The film seems to have the Jayendra motif to it and the visuals are of top notch. The cinematography of the film is handled by seasoned technician PC Sreeram who is known for his camera work. Kalyan Ram is trying his hands at a romantic story for the first time and the teaser leaves us with an impression that the actor seems to have fit the bill perfectly. Besides the visuals, ‘Naa Nuvve’ has breezy music which is being rendered by Sharreth, a Malayalam music composer, who made his debut in Telugu with ‘Kalavaramaye Madhilo’ in 2008. The first promotional package definitely makes an impact in terms of all elements which includes Tamannaah, Kalyan Ram, the visuals and the music and ‘Naa Nuvve’ gets added to the list of one of the most exciting flicks of 2018 to watch out for. ‘Naa Nuvve’ is being produced by Kiran Muppavarapu and Vijay Vattikuti under the banner Cool Breeze Cinemas and being presented by Mahesh S Koneru under the banner East Coast Productions.